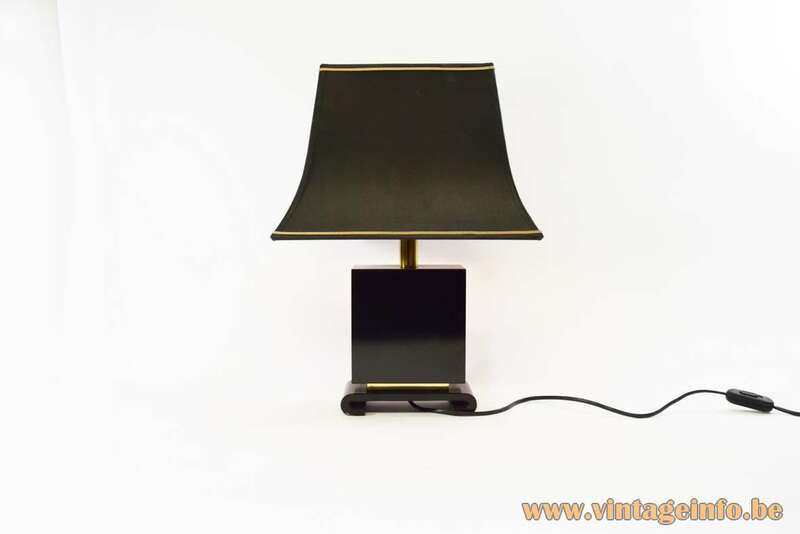 Materials: Black lacquered wood with gilded elements and brass parts, Bakelite socket. Partial photo of the painting “Enjoying Antiquities” by Tu Chin. 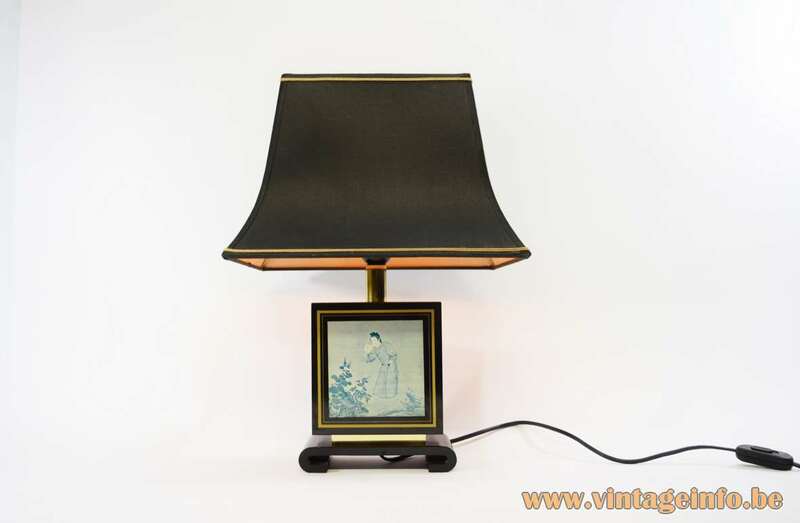 Black fabric pagoda lampshade with gold coloured borders. 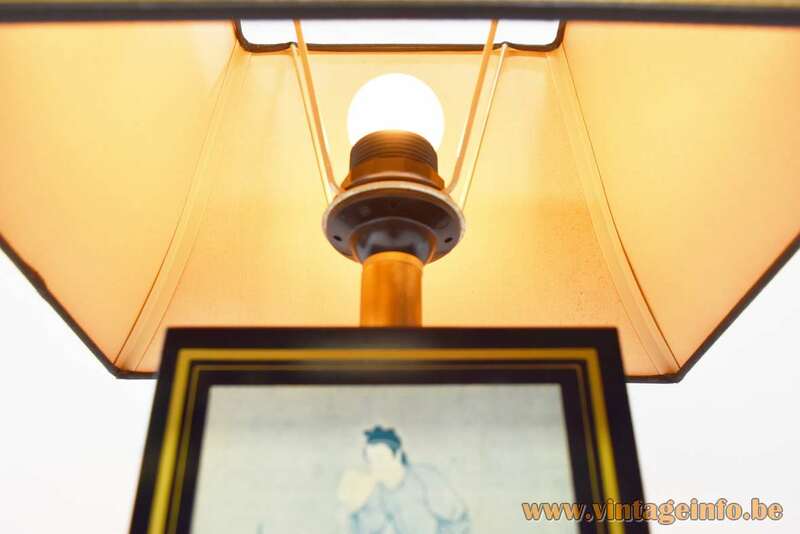 Electricity: 1 bulb E27 – 1 x 60 watt maximum – 110/220 volt. Manufacturer: Le Dauphin, Saint Marcellin, France. Other models: Exists also in a big version. 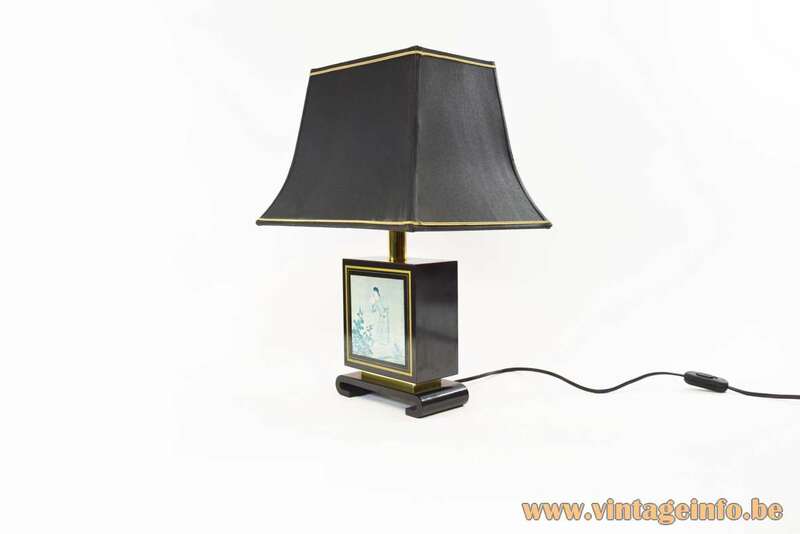 Le Dauphin made several table lamps in this style, all with paintings or drawings from China or Japan. 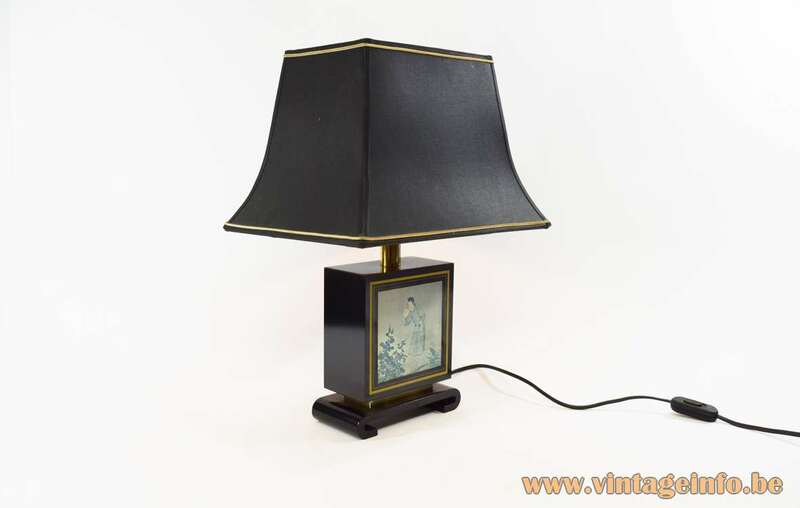 Also lamps with brass Chinese figurines were produced. 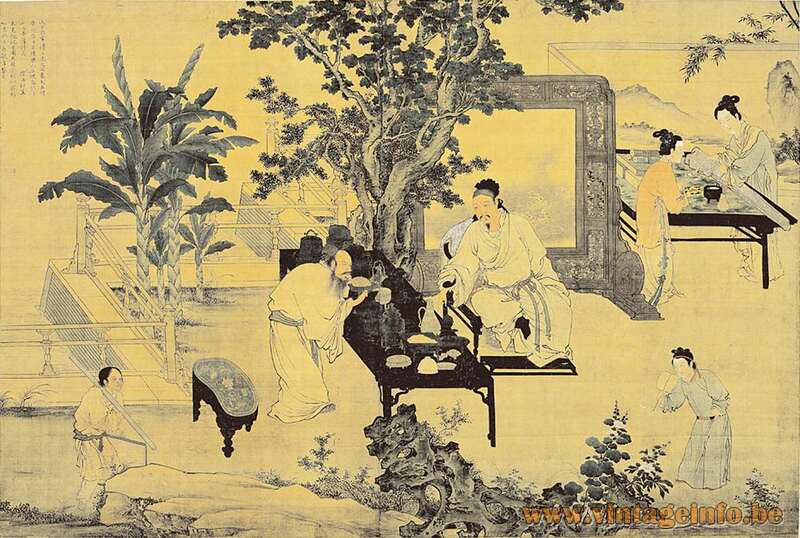 Enjoying Antiquities is a painting in ink and colour on silk by Tu Chin/Du Jin (ca. 1465-1509) during the Ming Dynasty (1368-1644). This famous work is exhibited in the National Palace Museum in Taiwan. 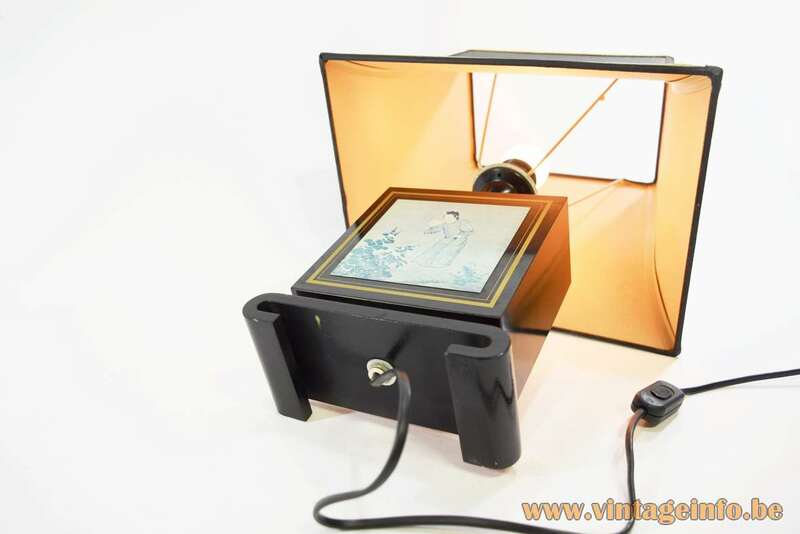 Originally, it may have been two hanging scroll panels mounted as a standing screen. 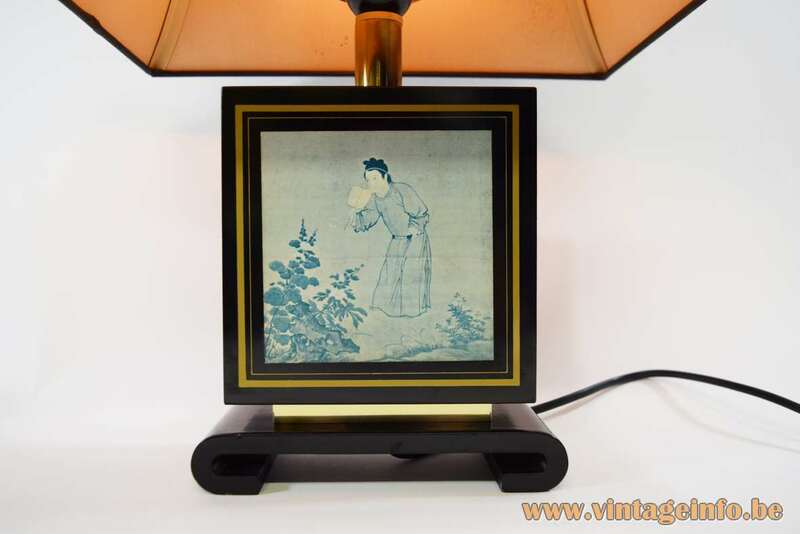 Representing the appreciation of antiquities, it depicts the leisurely activities of chess, calligraphy, zither, and painting associated with literati. The style is straightforward and elegant, much in the tradition of the Southern Sung (1127-1279) academic mode. Tu Chin’s fine brush style, as seen in the figures here, greatly influenced the style of T’ang Yin starting from the middle of his career. 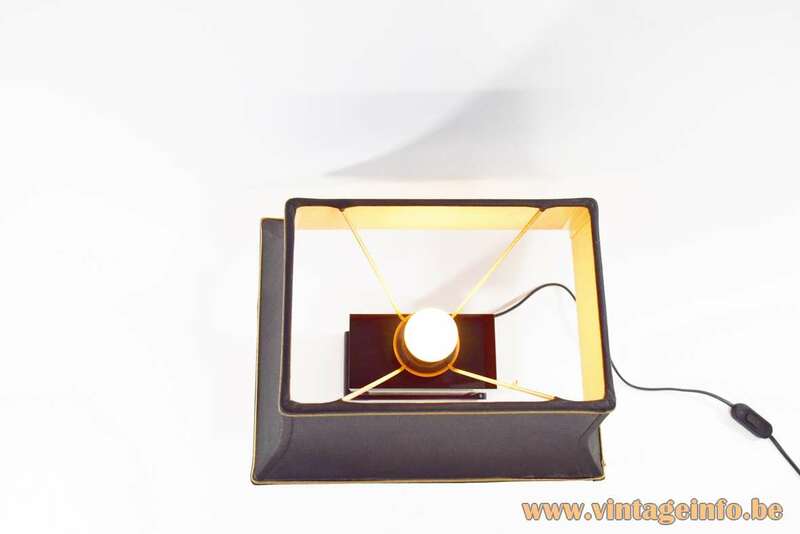 Located in the heart of the region Rhône Alpes since 1966, Le Dauphin is a brand famous for its high-end luminaires and its timeless style. The artisan factory is located in Saint-Marcellin, some 50 kilometers from Grenoble. Today Le Dauphin offers a wide range of light fixtures, from classic ceramics to decorated metal, through the transparency of hand-cut glass. “To dress the light so that it becomes a source of decoration” is the motto of the Le Dauphin company. The company name has it’s origin in the former name of the province were it’s located: Dauphiné.